The Cathedral of Christ the King that stands today in Lexington, Ky., was built in 1967 with elegant terrazzo floors that still shine today. In the decades since its consecration, the cathedral has seen its parish grow to more than 3,000 families. In response, Christ the King, which has been the cathedral for the Diocese of Lexington since 1988, embarked on a $5.3 million expansion project. The additions include a new perpetual adoration chapel for the Eucharist, a new altar tabernacle, a baptistery, and a rectory building. 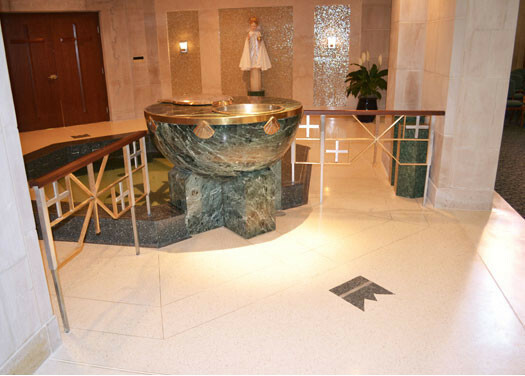 In both the new chapel and baptistery, new terrazzo was installed that matches the legacy terrazzo perfectly. “If you didn’t know any better, you’d think it was part of the original,” says Dino Martina, whose firm Martina Brothers Co. served as terrazzo contractor on the project.In the new baptistery, a marble baptismal font adjoins a small terrazzo pool for the total immersion of adults as they are baptized. There was a lot of preparation and craftsmanship that was involved in installing the terrazzo for the pool: Metal strips along the rim depicting intricate crowns and crosses had to be carefully filled with terrazzo, and the terrazzo steps were poured in place after the contractors ensured that every dimension of the octagonal pool was accurate.The church and its congregation celebrated the completion of the project with a consecration in the spring, just in time for baptisms during the Easter vigil. TERRAZZO CONTRACTOR: Martina Brothers Co.